A new member of the developers’ tools family has been announced earlier this month and the first beta will be available soon for download: Microsoft Visual Studio LightSwitch. What it is and what it is for? With LightSwitch we can easily and quickly create business applications from the scratch, including not only the application user interface forms, but also the application database; you can also create applications from existing databases. In this article I will provide an overview of LightSwitch using the beta version soon to be available. The project I will create is a simple application to record the books I loan to my friends. A new LightSwitch application starts by creating a new Visual Studio project. A LightSwitch project will contain application’s data and forms definitions. By using these definitions LightSwitch generates a SQL Server database and the source code in C# or Visual Basic. In this article I will use a C# project template. 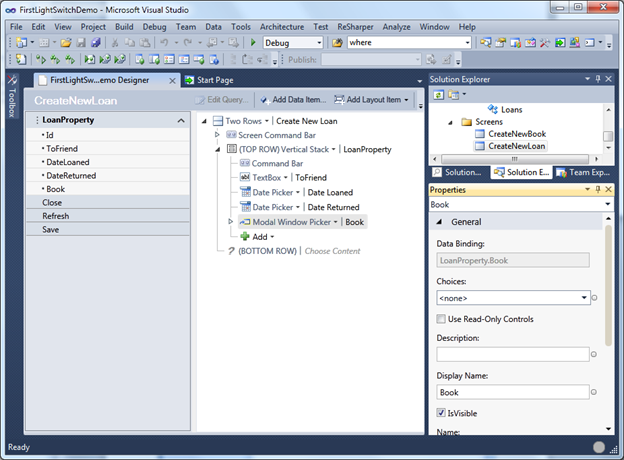 Here you can see the familiar Visual Studio new project dialog box, with the two templates provided by LightSwitch. Once the project is created we can connect to an existing data source or create a new data definition for the application. In this post I will show how to create data definitions from the scratch. The first thing to do is to define how book entities are. I am interested in each book’s author and title. Then we create an entity Book, with Author and Title fields, both of type String and both required. These entities will be stored in a Books table. Then a definition for loans is created. From each loan I am interested in knowing to whom I loaned the book, when the book was loaned, and when it was returned. Then we create a second entity called Loan, with fields ToFriend, DateLoaned and DateReturned; the first field is of type String and the two other are of type Date; the first two fields are required, but the latest is not. These entities will be stored in the Loans table. Now a new relationship between books and loans is defined. Now we need to define the forms to edit these entities. Many different form templates are available -allowing one record to be edited at a time, multiple records in a grid, etc. I will use a template for a simple record insertion. The form definition created by the wizard can be modified. I have changed only the name to display and the description of the form. The presentation tier, responsible for data manipulation and presentation to the user, is a Silverlight 4.0 application. The business logic tier, responsible for queries, updates, validation and processing of data, exposes a set of WCF RIA Domain Services running on an ASP.NET 4.0 in an IIS or a Windows Azure web role. The data tier, responsible for data storage, uses SQL Server or SQL Azure. In this article you can find more information about the architecture of a LightSwitch application. The application automatically assigns a new identifier to the first book. Out of the box, the application already has some simple validations, like the one corresponding to the fields marked as required. The second form is to insert loans. This is also a simple new record form. We can see how LightSwitch assigns a Date Picker control to the DateLoaned and DateReturned fields, of type Date. It also assigned a Modal Window Picker control to edit the association between a Loan and a Book. The Modal Window Picker control allows searching and selecting a book to be associated with a loan. The control includes not only the search features, but also allows paging results. Although this way to edit loans is not so bad, I would prefer to see the list of books, and from there to easily access each book’s loans, and eventually adding new books in the same place. The template for this kind of editing form is called List and Details Screen. Look how LightSwitch allows indicating if books’ and loans’ details should be included on the form. Once the form is created, we can edit its definition. Like in previous cases, I only slightly change the name to display and add a description. We can see how the new form looks when running the application. The list of books appears on the left. From there we can add, modify, and delete books. For the book selected in the list on the left, we can see the loans in the right. From there we can also add, modify, and delete loans. Be aware that for adding and modifying books and loans, LightSwitch automatically generated a form with the same controls defined in their respective new record forms. These forms have also the default behavior for validating the rules defined in the entities. When more than one record is changed in a list, modifications are not sent to the database until the list is saved by using the Save button. You can download the video from here. Okay, but what kind of applications is LightSwitch for? Perhaps we need to wait for a while to see who really takes advantage of this new technology. Simple applications like the one I created in this post can be created really quickly, but we all know that real world applications are not as easy to build as the ones I have demoed, are they? For non-professional or occasional developers –for whom other technologies like Microsoft Access or Visual FoxPro was created in the past-, LightSwitch can be their new preferred tool. Professional developer will probably not be able to build 100% of the complex business applications they create today by using LightSwitch, but at least they can use LightSwitch as a tool for rapid prototyping. In certain places in the application definition we can write C# code to add functions not provided by LightSwitch -for business rules for example. But then we need to know the object model of the code generated by LightSwitch, to be able to consume from our own handwritten code the types automatically generated by LightSwitch. Some of the templates seem to be extensible –this beta version includes templates lists with just an element, but probably it is because it is a beta. Furthermore, it seems that LightSwitch will be able to create applications for Windows Azure also. Since all the code and the database are generated from definitions, the same application could be migrated from the desktop to the cloud just by changing a setting in the project properties page. With an object model easy to be consumed in extension points and a strong ecosystem augmenting LightSwitch capabilities, it looks like we will be able to use it to develop applications more complex than the one created here. It is too soon yet, time will tell. La verdad me dejaste con la boca abierta! Excelente artículo. ¡Gracias Álvaro! Te mando un abrazo.